Today’s post comes to us from Anita Vandenberghe an Information Specialist at the Goodfellow Centre – Idea Central at Saint Kentigern College. 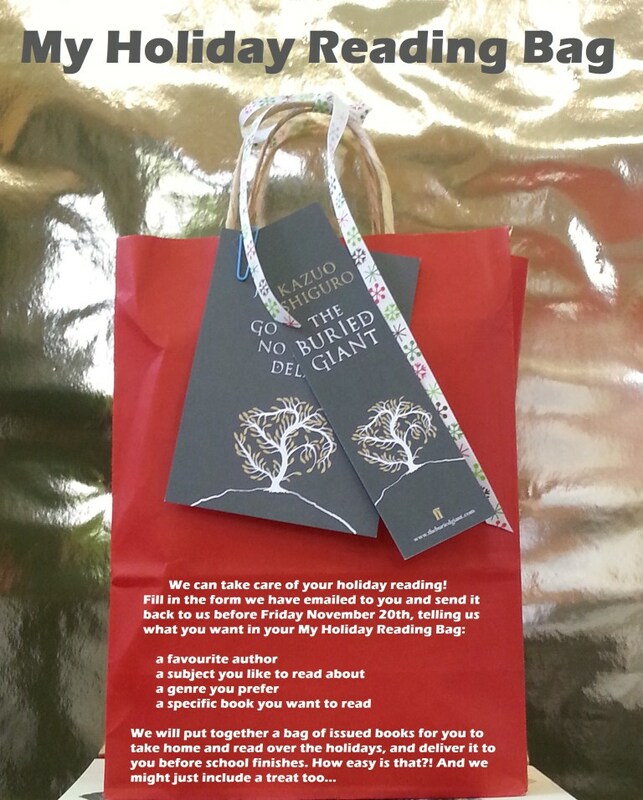 Anita has shared with us a great promotional activity they ran at her library. Thanks Anita! Our College has over 300 staff members and it is not always easy to get them to our Library. Midway the term we printed posters and send out emails to all staff. 3 Weeks before the last day of term 4, I showed staff, during the morning briefing, a red paper handbag, containing books, DVDs and a couple of magazines. Stapled to the bag were a postcard and bookmark with a literary quote, and attached to that a little chocolate Santa. The handles of the bag were tied together with a colourful ribbon. Inside were also a flyer to promote our eBook and eAudiobook collection and how to access the platforms. I promoted it as a special treat and explained that by ticking a number of boxes on the online request form, they could indicate what genres and type of materials they would like. When I finished my talk I received a standing ovation! People clapped and cheered and talked excitedly as if Santa had arrived and they were to receive a lovely present. It was very moving……. In the 1st week after our announcement we hardly received any responses but in the 2nd week the requests started coming in. 3 weeks later we had received 75 requests, often from staff members the names we didn’t recognize or teachers we’d never seen in the Library. 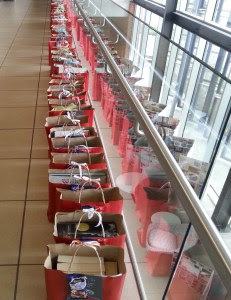 D-Day arrived and all bags were lined up along the glass balustrade near the entrance to the staffroom. It looked amazingly festive. Staff came in and excitedly collected their personalized bag. For them Christmas had begun! Was it a lot of work? Yes definitely. Was it worth it? Yes, Yes, Yes!